Part 26 of Wonders of World Engineering was published on Tuesday 24th August 1937, price 7d. It was the final part to Volume 1. Part 26 includes a photogravure supplement showing the construction of Silvertown Way, which illustrates the article London’s Dockland Highway. 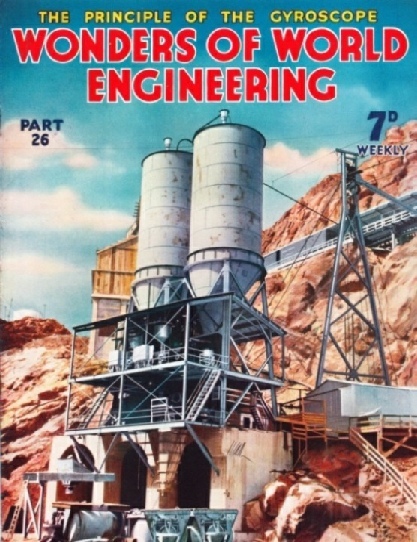 The cover of this week’s part gives some idea of what is required when a big concrete structure is to be built, for it shows one of the several concrete mixing plants used in the building of the Boulder Dam, described in the chapter on pages 47 to 58. Altogether, including subsidiary works, about 4,000,000 cubic yards of concrete were required. This amount involved the consumption of 755,360 tons of cement. An unusual feature was the method of charging the containers of the mixing plants from the silos in which the cement was blended and stored. The transport was effected by forcing the cement through pipes by means of compressed air. In one instance the pipe was 5,600 feet long (over a mile), and the cement was delivered to the container at the rate of 76 tons an hour. The cover was issued as a colour plate in Part 38. An account of how aerial surveys are carried out in specially equipped machines, with particular reference to the value of aircraft to mining engineers. The article is concluded from part 25. A familiar sound and sight was once the rhythmic tapping of the hammer of the stonebreaker as he sat by his heap at the side of the road. Even this simple operation is now generally performed mechanically. Road metal, when it is used at all, is prepared in crushing machines and carted to where it is required. These machines, which may be likened to gigantic nutcrackers, bear no resemblance to a hammer; but American engineering has produced a machine which almost exactly reproduces, on a greatly enlarged scale, the roadmender’s hammer. A machine of this type is shown in the photograph below. It is not used, however, for preparing road metal, but for breaking up rocks and boulders into pieces which can be readily removed, such clearance of the ground being more frequently necessary in the less thickly populated regions of the United States than in Great Britain. The machine, too, is not built specially for this purpose. It forms another application of the excavating machine which can already be used in a variety of ways - for instance, with a bucket for gnawing away a bank. 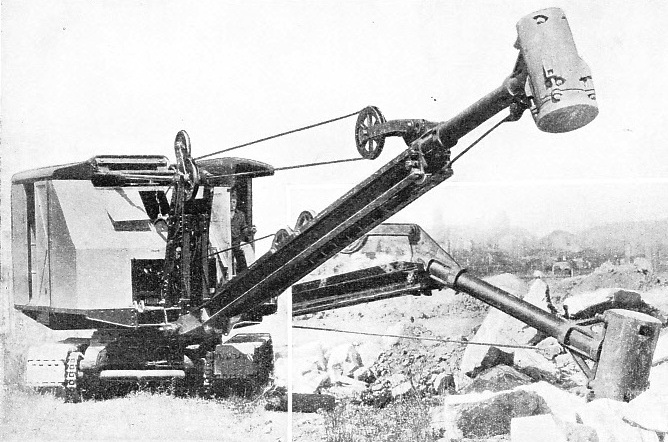 The excavating machine is adapted for its various duties by alterations to the parts carried on the jib or boom, the mighty hammer here shown being one such form of alteration. The body of the machine is mounted on the now familiar crawlers for movement from place to place, and is also capable of being slewed round in a circle on the crawler chassis. The jib can be raised or lowered in the same way as that of a crane. The hammer, however, is not rigidly attached to the jib, but its “handle” is hinged as shown. Not only, then, can it be allowed to fall by slackening the jib ropes, but, by tightening the hammer rope at the appropriate moment, additional force can be given to the blow. The hammer weighs about 1⅜ tons and can be dropped from any height between 5 feet and 10 feet at the rate of twenty blows a minute. The hammer is shown at the bottom of the photograph smashing up pieces of rock lying on the ground. It can be used in this position also for such purposes as breaking up metals in the foundry or scrap heap or for consolidating loose earth. But this is not all; by a rearrangement of the hammer and ropes, the machine can be made to give a blow against a vertical surface. It can thus be used for demolishing walls or small structures. The face of the hammer is made so that it can be altered to suit the particular job the machine is to be used for. Thus a convex face may be desirable for breaking material or a flat face for tamping, while a pointed face may be fitted so that the effect of a gigantic pick-axe is secured. The driving machinery is that generally fitted to excavating machines - an internal combustion engine with suitable winches and so forth. This is the sixteenth article in the series on Modern Engineering Practice. One of the greatest feats of highway engineering that London has ever seen was the building of Silvertown Way, a mile-long stretch of elevated highway which carries heavy traffic for the docks over minor roads, railways and other obstructions. The photogravure section shows some striking views of the building of Silvertown Way, the magnificent new road to the heart of the “Royal” Docks in the Port of London. The building of this great highway is described in this chapter by A P Luscombe Whyte. The route which commercial traffic laden with the goods handled by the world’s largest port had to take consisted of narrow, twisting streets hampered by a swing bridge, by level crossings and by right-angled turns. The congestion was appalling. 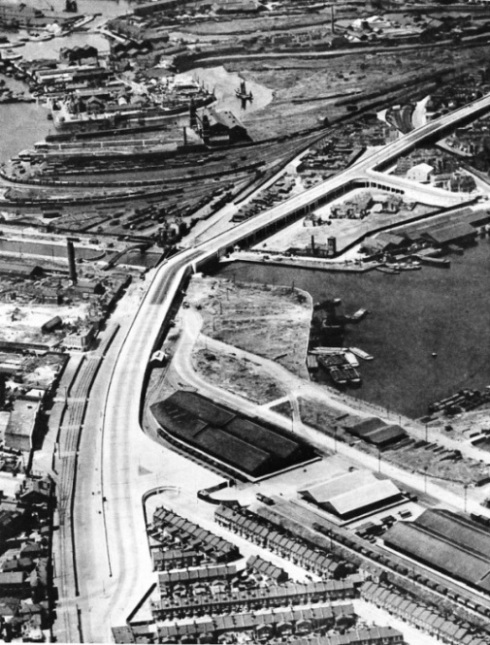 Silvertown Way, an entirely new thoroughfare including viaducts, bridges and approach roads, was opened in September 1934 at a cost of about £2,500,000. Ingenious and elaborate machinery is used for the production in large quantities of radio receivers. The high degree of precision necessary in this work is achieved by the use of special tools and the most modern methods of assembly. To deal with such a large industry in which an enormous number of different types of radio set is produced it is necessary for the sake of clarity to take one representative as an example of the processes in the industry as a whole. 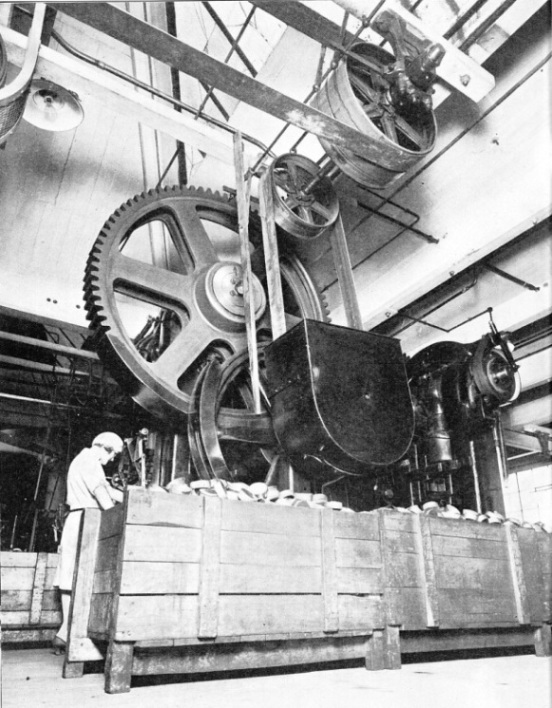 In this chapter L H Thomas describes the processes that are in operation in one such factory. It is the eighth article in the series on the Romance of Industry. SILVERTOWN WAY COMPLETED. The new bridge across the entrance to the Tidal Basin has a span of 103 feet. Two spur roads lead down to the docks from the viaduct which runs about 25 feet above ground level. ASSEMBLING LOUDSPEAKERS in a modern factory. 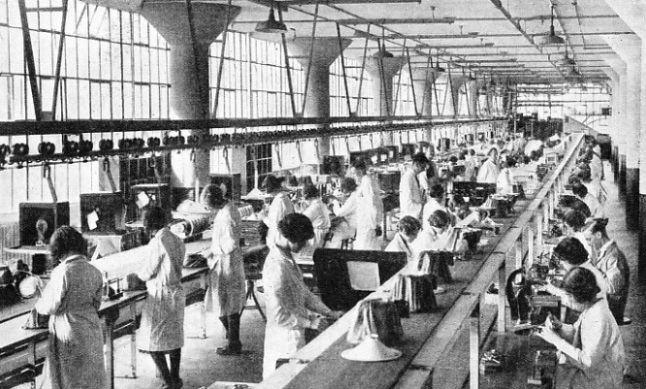 The assembly lines consist of slowly moving conveyer belts which carry the parts, on which the girls are working, from one end of the shop to the other at a steady speed. THE MAIN VIADUCT which carries Silvertown Way is of concrete, heavily reinforced with steel rods up to 1½ in thick. 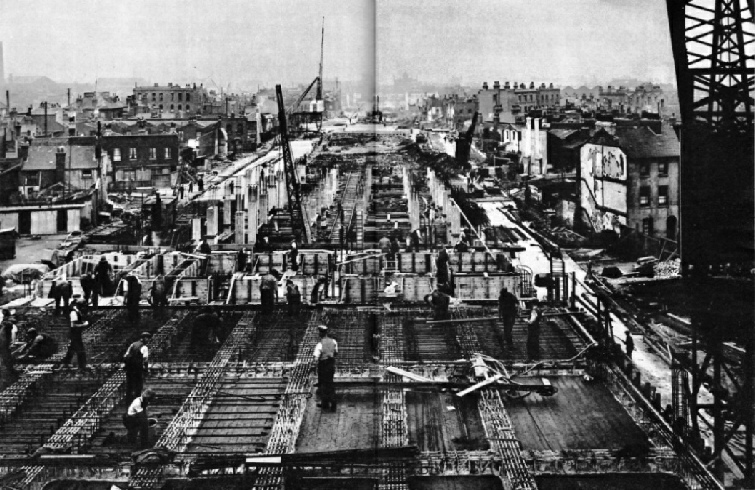 The roadway is carried on a concrete deck 1 foot thick, resting on transverse and longitudinal beams supported on rows of six columns rising from pile caps. STAMPING OUT METAL PARTS in a single operation - one of the large-scale processes used in a radio set factory. 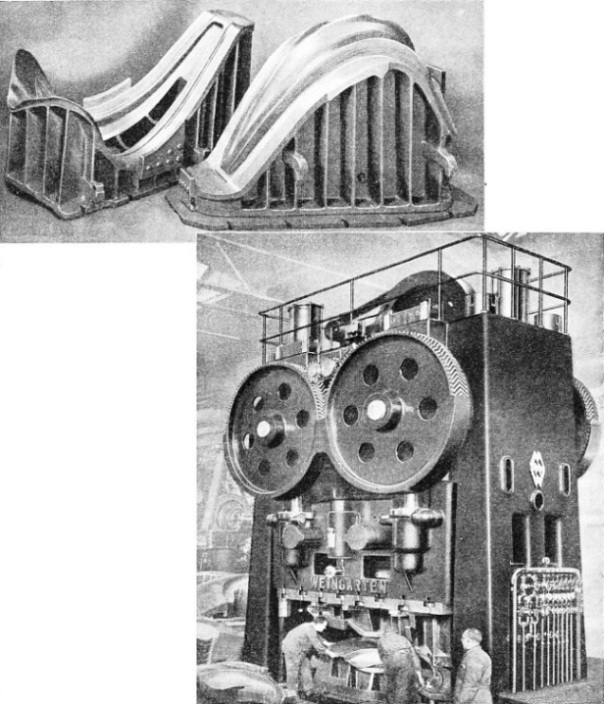 There are not many large metal components in some modern radio receivers, but sets of the radio-gramophone type necessitate several stamping operations for which large punch presses are used. SILVERTOWN WAY was opened in September 1934 to relieve the extreme congestion on the streets which gave access to the Royal Docks in the Port of London. The new road has a total width of 108 feet, and at the point here shown it divides into three ways, the centre one rising to form a through-traffic viaduct 25 feet above the side ways, which serve local traffic requirements. Aircraft, warships and merchant vessels have derived the most striking benefits from the application of the gyroscope to various instruments, but the gyroscopic principle is involved in many fields of engineering. The principle of the gyroscope - a principle so well illustrated by the toy gyroscopes which fascinate grown-ups as much as they do children - is used in many forms by engineers. The gyro wheel is a mystery to most people. There are few people who can visualize what is the full significance of the term “rigid” or “fixed in space”. Yet the meaning of these properties of the gyro wheel is explained by F E Dean in a chapter which describes how the gyro is put to various uses by the engineer. 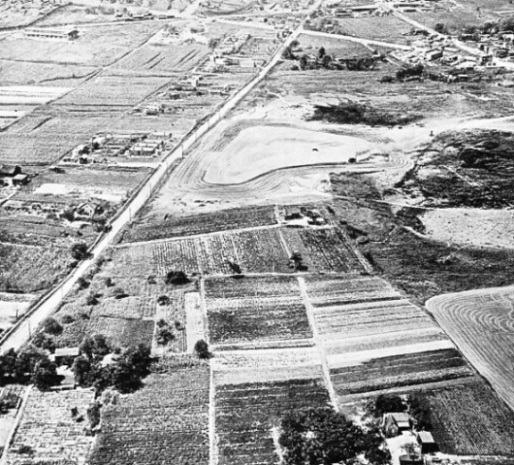 OUTSTANDING DETAILS appear almost in relief in a photograph taken from the air, as shown by this photograph of the outskirts of St Louis, Missouri. The nature of the land is indicated with remarkable clarity and geologists and other scientists can deduce much of importance to the engineer from photographs, especially if stereoscopic pictures are taken. 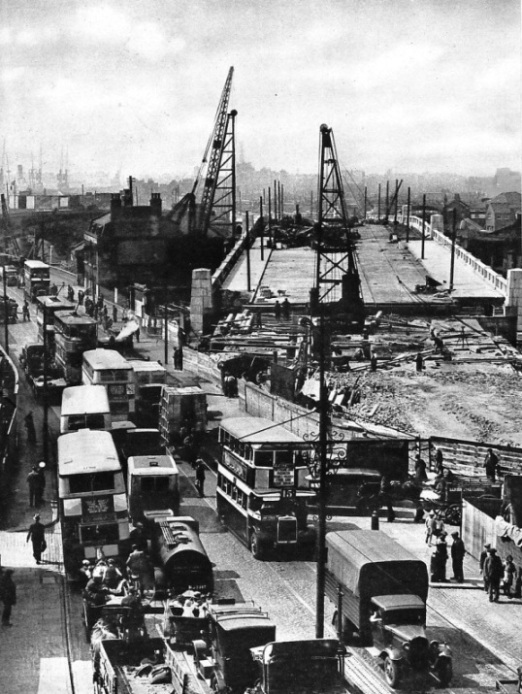 TRAFFIC CONGESTION on Barking Road was enormous before the new bridge was built across the River Lea. The approach to the new bridge can be seen in this photograph. For the foundations of the road large numbers of 14-in piles up to 50 feet long were driven through the subsoil into the firm clay. The enormous steel lathes which are seen in engineering shops to-day are the outcome of Henry Maudslay’s invention of the screwcutting lathe. Even the huge modern boring and drilling machines can be related to this epoch-making invention. The development of machine tools is the subject of this chapter by T J Fielding. The machines which are used in workshops to-day for boring, drilling and turning operations are of enormous weight and size, capable of handling work of great dimensions. A GIGANTIC PUNCH PRESS by means of which motor car bodies may be stamped out of sheet steel. The top photograph shows the dies which are used for pressing the wings. The ram of a large press of the enclosed type is driven by two horizontally arranged crankshafts with four connecting rods. This system prevents the ram from tilting when the die pressure is uneven. The drive is enclosed and is separated into two units, one for the sheet holder and one for the ram. The design and construction of a large bathing pool, with covered promenades, diving stages, sunbathing decks and a restaurant, is a considerable feat of engineering and one which gives great scope to the worker in reinforced concrete. 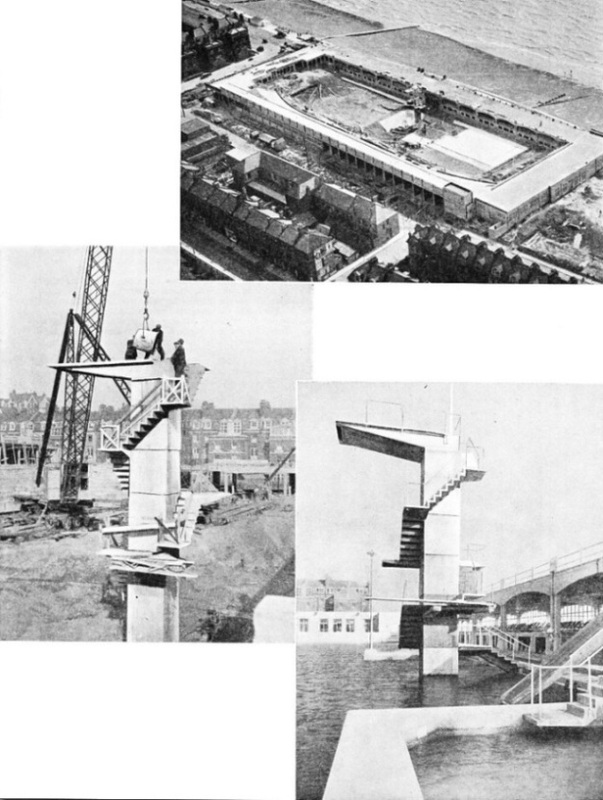 The accompanying illustrations show several aspects of the building of the municipal bathing pool at Hastings, Sussex, which is one of the largest and most up-to-date pools in Great Britain. THE DIVING TOWER and covered promenade (left) nearing completion. The covered promenade on the left of the tower is 446 feet long and 30 feet wide; its roof, which is surfaced with asphalt, forms an open deck with the sea on one side and the pool on the other. The tower had a total height of 48 feet from the bottom of the pool; its lower 19-feet section is a plain reinforced concrete shaft, and the upper part carries a flight of steps and the diving platforms. The ingenious method of construction is seen in the two illustrations below. BUILDING THE DIVING TOWER. The steel skeleton reinforcement was first placed in position. 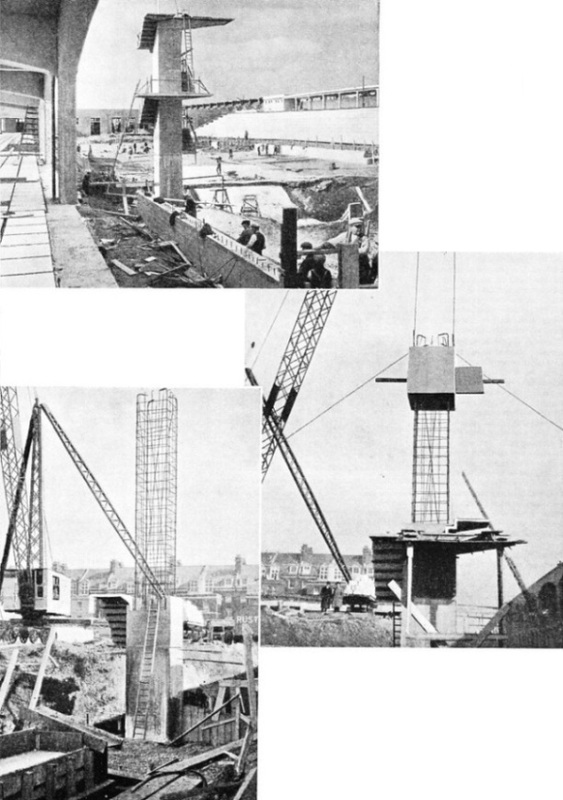 Hollow concrete shells, weighing about five tons, were cast on the ground and then lifted by a derrick crane, threaded over the reinforcement, dropped into position and filled with concrete. The illustration on the left shows a shell in position; that above shows another shell being threaded on to the skeleton. The shells were of uniform design. Each consisted of the outer skin of the tower, 3 in thick, with one flight of stairs, and each shell had either a landing or provision for a diving stage. 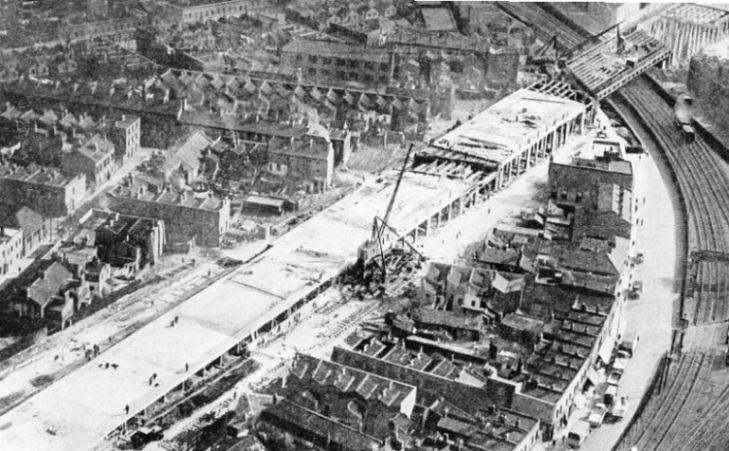 AN AERIAL VIEW OF THE HASTINGS BATHING POOL during the early stages of the constructional work. The upper promenade encircles the pool and is formed by the roofs of the entrance block, the covered promenade on the sea side, the cafe and the back platform of the grand stand. In front of the diving tower the floor of the pool is 15 feet below the water level; along the central band it rises from 6 feet to 3 ft 6 in at either end. The diving basin and the central deep band are provided with under-water lighting. The Borough Engineer was responsible for the entire design. The pool cost £80,000 to build. POURING THE CONCRETE (above) with the top diving platform in position on the tower. The finished pool (right) is 330 feet long and 90 feet wide, with a maximum depth of 15 feet. Its capacity is 865,000 gallons of water, which is circulated and filtered every 7½ hours. Water is drawn from the bottom of the diving pit and run to the filter house, where it is chemically treated. It is then delivered to gravity-type sand filters, from which it flows to a common main and a controlling chamber. The filtered water, after aeration, re-enters the pool at the shallow end. THE GYROCOMPASS is used in ships of every description. The Sperry merchant marine gyrocompass contains a single gyrowheel with a diameter of 10 in. It weighs 55 lb and is spun at 6,000 revolutions a minute by a self-contained induction motor. STABILIZING EQUIPMENT for the Italian liner Conte di Savoia weighs 660 tons. 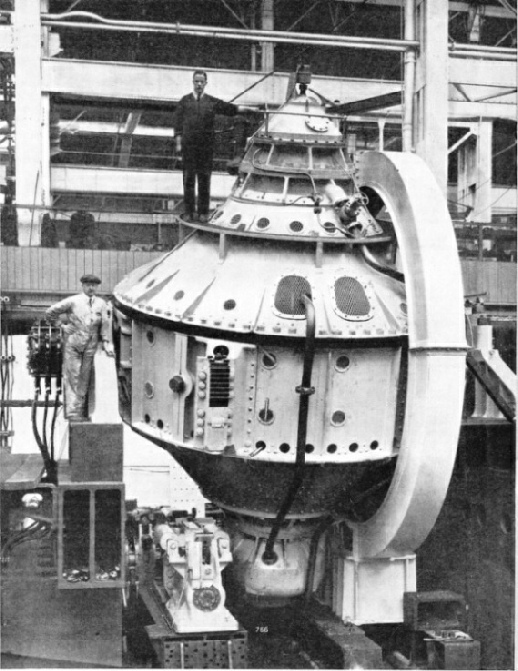 The photograph shows one of the three huge gyrowheels mounted inside a casing. The wheel has a diameter of 13 feet and spins at 800 revolutions a minute. A small electric gyrowheel, when precessed (or tilted) by a slight roll of the ship, starts up an electric motor that precesses the big gyro, which exerts an enormous pressure on the casing trunnions attached to the ships’s hull, thus correcting the roll.